Freedom Boat Club is Lake Conroe's Premier Boat Club offering higher end vessels to those that want to get on the water without all the expense and time associated with owning and maintain a boat. We believe boating should be an escape rather than a nuisance. 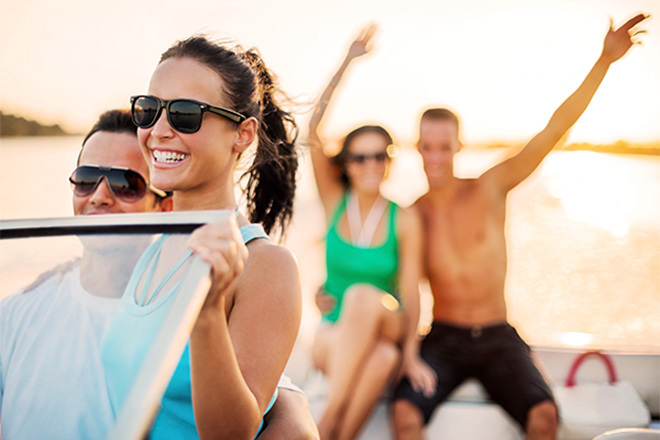 To us, boating is a way for people to relax and have FUN while connecting with friends and family to create life-long memories. Freedom Boat Club is the smart alternative to Boat ownership...Boating Made Simple! We are located at the Waterpoint Marina on beautiful Lake Conroe, approximately one hour north of downtown Houston and 19 miles north of The Woodlands. Extending 21 miles in length and covering 21,000 surface acres, Lake Conroe offers a large variety of recreational activities. Whether your escape is wakeboarding, skiing, swimming, fishing, or just reading in a quiet cove, this location has it all. When you join Freedom Boat Club (FBC) Lake Conroe, you will receive unlimited use of our fleet of boats. Plus, you will have access to the entire FBC family of locations around the country without any additional charges, fees or costs. We do all the work, while you have Fun! Reliable and Well Equipped Vessels: In addition to all the required safety equipment and onboard sound systems, FBC boats are equipped with quiet fuel efficient 4-stroke outboards or Mercury IO's. Safety and Training: As a FBC member, you are offered personalized training. We have USCG certified captains that provide individual instruction in boat handling and water safety. Help When You Need It, Fun When You Want It: Your boating experience begins when you arrive at the dock. The dock master helps you get all your belongings loaded on the boat. You and your family and/or friends head out on the water without delay. When you return, the dock staff will help you ashore and assist with loading your belongings into your car. -Cleaning: We clean the boat, which normally consumes two thirds of a boat owner's time, leaving only one third spent enjoying the water. As a FBC member, 100% of your time will be spent on the water. -Maintenance: We do all the required mechanical and preventative maintenance; a boat owner's average annual cost of maintenance is 15% of the purchase price of the boat. -Storage: We store the boat; marina storage averages $12 per ft, per month. And with the FBC membership, you have none of the hassles of trailering. -Insurance Payments: Watercraft Liability, Physical Damage and Towing insurance is included in your membership. As a FBC member, you are covered up to $1,000,000 for claims made against you by 3rd parties. Year Round Boating: We are open 6 days a week. (Tuesday - Sunday). Reservation System at Your Fingertips: We have a Web-based Reservation System that can be accessed 24/7/365. Our reservation system allows up to four advanced rolling reservations to be made at any given time. Reservations can be made up to six months in advance. In addition to the advanced reservations, you have unlimited "spur of the moment" use of the boats. Simply call the dock master to check availability. Hassle-Free Boating: FBC provides a hassle free boating lifestyle that you can only enjoy by becoming a member. Check us out on Facebook. Like Us and see all the fun our members are having. Now in our 28th year of operation, Freedom Boat Club is the country’s First, Biggest and Fastest Growing Nationally Franchised Boat Club. This is why many see the club as the 'smartest' option for Boating. *New Locations - 110 Locations Nation-wide (on avg 13-15 new locations added each year). Now that you have read some of the basic information about Freedom Boat Club, I am sure you've come across a question or two. Or maybe you'd like to come down to the Marina and see our fleet of boats. Please feel free to call or email us and we will help you understand all that Freedom Boat Club has to offer! The Boats Are Waiting...Why Are You?